There is no word for “good-bye” in her language, said Catheryn St. Germaine, who affiliates herself with the Ojibwe and Odawa tribes. As the desk receptionist for the American Indian Center of Chicago, St. Germaine helps to promote the mission of the center, which is to keep the presence of Native Americans alive in Chicago. 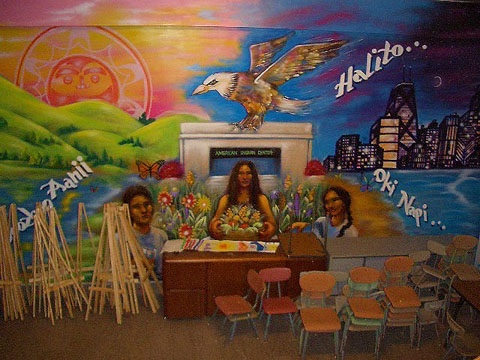 The American Indian Center (AIC) of Chicago, located at 1630 W. Wilson Ave., was created in 1953 as a result of Native Americans being forced off of their reservations to go live in cities and assimilate to what is known as the white man’s culture. The coordinator of professional development at the American Indian Center, Adam Kessel, who affiliates himself with the Lakota tribe, and the special events coordinator Cyndee Fox-Starr, who refers to himself as Omaha-Odawa or Bear clan, talked about experiences his parents had at a boarding school that tried to rid them of their cultural beliefs. Kessel talked passionately about the Indian Relocation Act of 1956 that resulted in the dehumanization of Native Americans. As a result of this act, the number of Native Americans in urban places increased. Thus, communities such as the AIC were necessary to keep Native American culture alive in large cities. “Students and their families carry such unique stories that define who they are and their experiences that it’s hard to really boil it down to why folks don’t understand native history, and it's because it has been excluded from the larger dialogue of American history,” Kessel said. The boarding school experience that Fox-Starr’s parents had also tried to rob Native American’s of their culture and assign them a new one that more resembled the westernized culture. Children as young as three were taken from their parents and sent to boarding schools to adapt the Christian way of life. The AIC offers a variety of programs available to those Native Americans striving to keep their heritage present in their lives and revive what the U.S. government took from them. For students grades K-12, an after school program is offered four days of the week that educates young Native Americans about their culture and history, which they may not get taught in typical Chicago schools. Computer classes are also offered to anyone who wishes to learn how to use the Internet or the many other programs technology has to offer. In addition to educational programs, the AIC offers a series of artistic workshops and works closely with the Trickster Gallery in Schaumburg, a Native American arts institution. The Trickster Gallery, located at 190 S. Roselle Rd., not only features Native American art but also speakers and film showings. To honor traditional Native American holidays, the AIC hosts various powwows throughout the year. At these powwows, Native Americans sing, dance, drum, design and create regalia, and other traditional activities. In order to promote health and wellness, the AIC has its very own medicinal garden located in front of the center. Eli Suzukovich, who affiliates with the Chippewa-Cree tribe, works as the garden manager/research assistant at the AIC and tends to the garden. The AIC takes great pride in their medicinal garden. According to Suzukovich, too many chemicals are added to medicines nowadays when plants from the Mother Earth could be used if they were just planted and harvested properly. The AIC recently transformed their medicinal garden by burning the plants, allowing them to grow again in the fresh new soil. Currently, the garden is the largest it has ever been with a nature trail and benches so that people can take a stroll, relax, and enjoy the many animals and medicinal practices taking place. By offering resources such as the medicinal garden, the AIC works towards promoting Native American culture and keeping its beliefs and practices alive.